The F800 concept at the Geneva auto show demonstrates one way Mercedes could shape a fuel-efficient future. The car can run 25 miles on electricity and gets 80 mpg, with a top speed of 80 mph. GENEVA -- Daimler AG's Mercedes-Benz unit will roll out plug-in hybrids and fuel cell cars in every segment over the next few years, doubling its investment in green technologies in the next two years. Mercedes intends to spend $1.4 billion in each of the next two years to develop batteries and fuel-saving engines. Annual spending averaged $700 million over the past three years. In addition, the automaker will create a "flexible architecture so we can install the right powertrain for each customer -- plug-in hybrid or pure electric fuel cell," Thomas Weber, head of Daimler's r&d, said in an interview last week at the Geneva auto show. -- Small cars: Within a few years, Daimler will sell electric versions of the front-wheel-drive subcompact A class, compact B class and Smart cars. -- Mid-sized, large cars: E-class and S-class vehicles, as well as their derived coupes, will have plug-in hybrid and possibly electric powerplants. Mercedes-Benz already offers a full-hybrid M-class crossover. The next vehicle to get a plug-in hybrid powerplant will be the E class, most likely next year. The C-class hybrid would come in a few years when that car is replaced, Weber said. In the next 10 years, sales of alternative-fuel vehicles will be "in the high numbers in some regions," Weber said. "In the S class, we could have a 100 percent hybrid share in some markets -- perhaps in Europe." Weber said that's based on the 20 percent take rate worldwide for the S-class hybrid -- the S400 sedan, launched last summer. He expects that about 20 to 30 percent of all E-class cars sold in the future will be hybrids. Mercedes-Benz is working on a flexible architecture that could house a gasoline engine, diesel engine, hybrid or fuel cell powerplant. The F800 concept, shown in Geneva, demonstrated a possible approach. 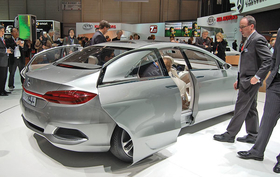 The architecture first will be used with the next-generation S class, due in 2014, Weber said. The F800 show car can run 25 miles on electric power and has a fuel economy of 80 mpg on a European test cycle. It has a top speed of 80 mph, Weber said. Because Mercedes wants to be at the forefront of electric technology, it will be making many components in-house and with joint-venture supplier partners. Said Weber: "If you want to be market leader, you cannot wait until the supplier sells you these components. It means you push the pedal."